NORTH BAY, Ont. 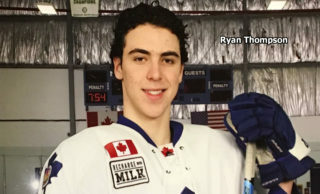 — The newest crop of North Bay Battalion prospects wrapped up the Ontario Hockey League club’s two-day orientation camp Sunday. A total of 30 skaters and five goaltenders attended the camp, with all but goaltender David Cunti, who has a broken finger, taking to the Memorial Gardens ice for two games. 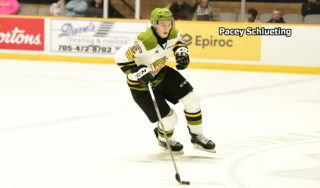 The camp, which opened with fitness testing, featured the first on-ice appearance in Battalion colours of right winger Brandon Coe, the Troops’ first-round pick in the 2017 OHL Priority Selection, who arrived having already signed a standard player’s agreement, including an education package, with the club. Coe, who played last season with the Toronto Nationals minor midgets, received a Battalion sweater bearing No. 17 to denote the year of his selection from Abbott. 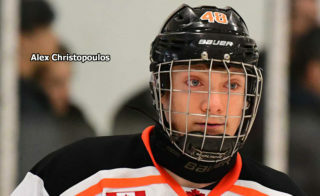 Butler said defenceman Simon Rose from the Pembroke Lumber Kings minor midgets and centre Kurtis Evans of the Central Ontario Wolves minor midgets, the second- and third-round selections respectively, signed during the weekend. 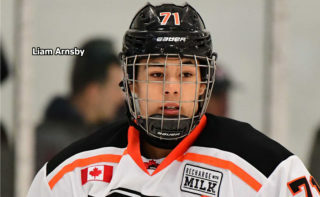 All 16 picks from the OHL Priority Selection on April 8 were at the camp, as were all five picks in the OHL Under-18 Priority Selection four days later. 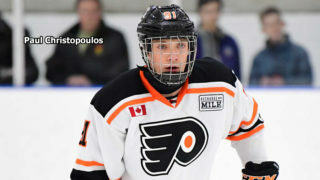 Eight homegrown products attended, including defenceman Payton Vescio, centre Ryan Mills and right winger Mat Hardwick, taken in the 2017 OHL Priority Selection, and right winger Nick Davis, who was chosen in the Under-18 process. 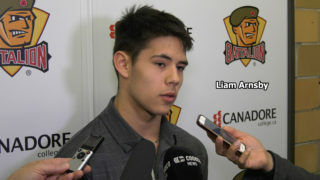 Defenceman Tye Lindeman was selected in 2016, while goaltender Drew Joyal, centre Will Petrie and defenceman Eric Mondoux were free-agent invitees. All are North Bay residents except Mills, who lives in adjacent Callander. Kyle Mandleur scored two goals to pace Team White to a 6-3 victory Sunday over Team Green and a sweep of the two camp games, played in three periods of 25 minutes of stop time. The bench bosses were assistant coaches Adam Dennis and John Dean for White and Green respectively. Davis, Ryland Mosley, Hardwick and Kyle Brothers had a goal apiece for the winners, with goaltenders Max Wright, who earned his second win, and Will Barber splitting time in net. Owen Diodati, Rose and Mills scored for Green, backstopped by goaltenders Christian Cicigoi and Joyal. In the opener Saturday, Hardwick and Davis provided two goals each in a 7-3 victory. Mandleur, Mosley and Coe had White’s other goals. Scoring for Green were Harrison Caines, Justin Paul and Diodati. Max Wright, Will Barber, Tye Lindeman, Nathan Porter, Brett Humberstone, Payton Vescio, Maxim Mulder, Mat Hardwick, Curtis Kuzmyk, Rhys Brown, Will Petrie, Kyle Mandleur, Brandon Coe, Ryland Mosley, Nick Davis, Kyle Brothers, Owen Belisle. Christian Cicigoi, Drew Joyal, Jordan Spadafore, Travis Mailhot, Simon Rose, Andrew Lukezic, Eric Mondoux, Owen Diodati, Patrick Brown, Harrison Caines, Kurtis Evans, Ryan Mills, Parker Bowman, Jared Weber, Francois Drouin, Greg Hay, Justin Paul.